Guilty Non-Jew: Alfred Hitchcock showed little interest in Jewish matters. But guilt and blame certainly play major roles in his work. 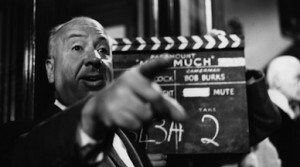 Alfred Hitchcock’s reputation as one of the greatest film directors of all time is safely in the can, so all that’s left to deal with is the man himself. Two new films — “Hitchcock,” a biopic starring Anthony Hopkins, and the HBO film “The Girl,” about Hitch’s troubled relationship with actress Tippi Hedren — have attempted to do just that. These films attempt to humanize — or dehumanize or demonize — Hitchcock, depending on your point of view. What neither of these films mentions, however, and what you probably won’t hear much about in the renewed discussion of Hitchcock, is the chapter of his career in which he lent his formidable directorial skills to the British army for what eventually became “Memory of the Camps,” a documentary consisting exclusively of footage of concentration camps in the days after their liberation by Allied forces. This article published November 15, 2012, in the November 23, 2012, issue of The Forward.